Tracy McGrady was a prolific scorer during his prime and one of the main faces of the NBA for several years. Although his teams did not see much playoff success, he was widely considered to be one of the biggest NBA stars during the 2000s. Unfortunately, injuries and his diminishing abilities ability kept him from superstardom. It also did not help that his prime years were spent between three teams. With his official retirement from the NBA, Tracy McGrady cards are once again seeing interest from collectors. Just like Kobe Bryant and Kevin Garnett in previous years, Tracy McGrady declared for the NBA Draft straight out of high school. McGrady was named the USA Today High School Player of the Year in 1997 and he was virtually a lock to be lottery pick in the 1997 NBA Draft. The Toronto Raptors ultimately selected McGrady with the ninth pick. 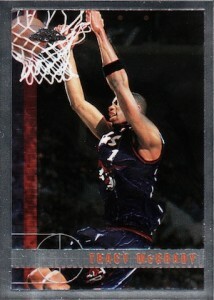 Fellow All-Stars, Tim Duncan and Chauncey Billups, were also part of the same draft class as McGrady. Tracy McGrady got off to a slow start in Toronto, mainly playing in a reserve role during his first two seasons. The Raptors would draft his cousin, Vince Carter, during the 1998 NBA Draft. 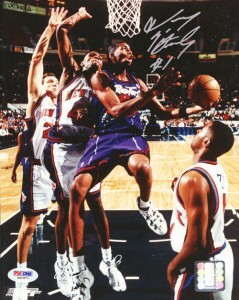 Season three saw McGrady take his game to the next level and he was a starter almost half the year. Things kept building for the Raptors, as Tracy McGrady and Vince Carter lead the team to the playoffs. Following his third year, McGrady decided to explore free agency. He soon signed with the Orland Magic. Orlando was T-Mac's coming out party. While he had built a reputation as good player in Toronto, he was a star in Orlando. He was named an All-Star in all four seasons in Orlando and was the scoring champion in his last two seasons there. Despite his individual success, the team did not materialize as expected. After one particularly bad season for the team, Orlando won the draft lottery to receive the first overall pick in the 2004 NBA Draft. They shipped McGrady to the Houston Rockets as part of a seven-player deal, which included Steve Francis going to Orlando. The Magic would select Dwight Howard with their first pick. Houston was the peak of Tracy McGrady's fame. He joined Yao Ming in Houston to form a strong pairing, however, playoff success still eluded him. After a few strong seasons, the injury bug caught up with McGrady and he would never be the same. He was traded to the New York Knicks in 2010, and then did one-year stints in Detroit and Atlanta. McGrady would spend the 2012-13 season with the Qingdao Eagles of the Chinese Basketball Association, and then joined the San Antonio Spurs during the end of the 2012-13 NBA season. This would be his last NBA season. Tracy McGrady will be remembered most for his dazzling dunks and scoring prowess. Although he ultimately failed to reach the heights that were expected, the seven-time All-Star was no slouch. 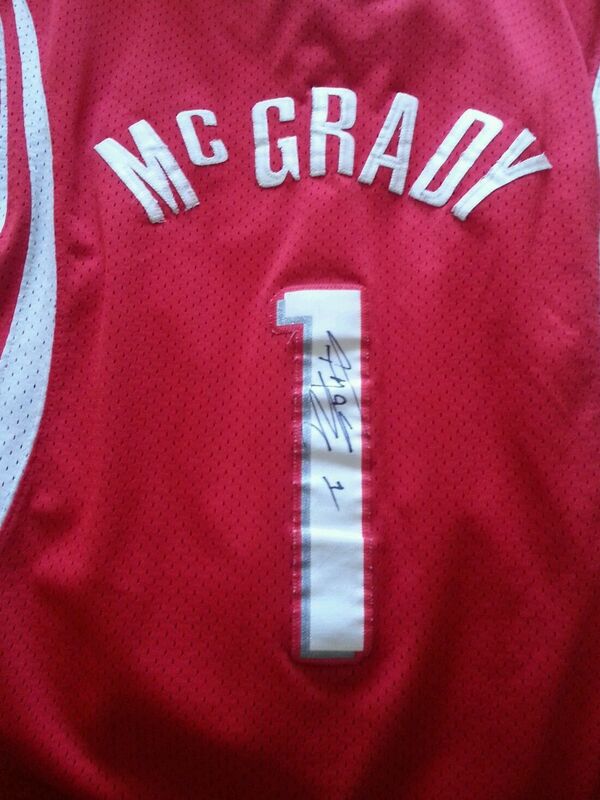 At this point, the investment potential is not great for McGrady. If and when he joins Hall of Fame, his cards and memorabilia should see a good bump in value. McGrady has 18 rookie cards that fall mostly in the low and mid-range values. Parallels are quite popular since the base cards are fairly common. 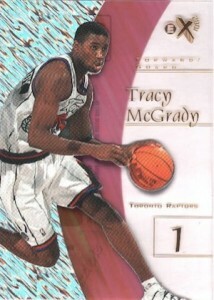 Two Tracy McGrady cards are singled out based on value and popularity. 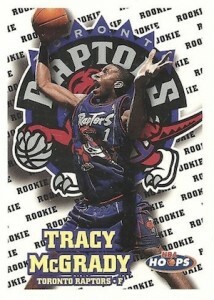 The 1997-98 Topps Chrome Tracy McGrady card is not especially impressive. However, the strong brand recognition and general lack of high-level options make it the clear favorite for collectors. Refractor parallels add further options for Tracy McGrady collectors. 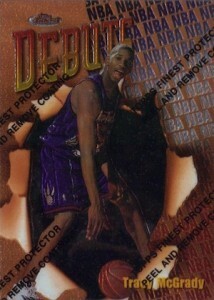 The clear image of McGrady in his Finest rookie card shows just how young he was as a rookie. There certainly is a lot going on with this card, but collectors generally know what to expect from Finest, and this is nothing out of the ordinary. 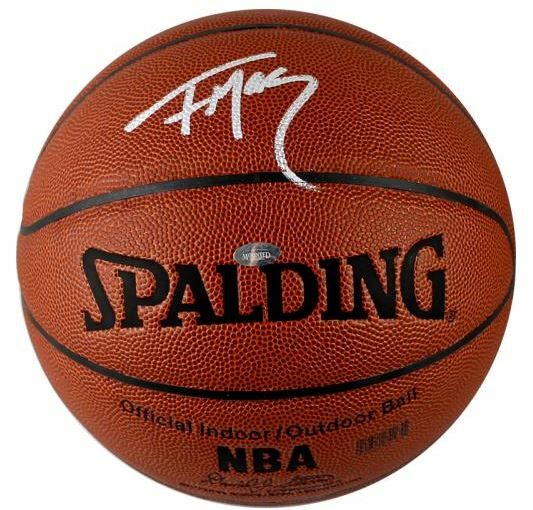 Below you will find an example of what Tracy McGrady's authentic signature looks like. This can be used as a first point of reference for determining the legitimacy of autograph memorabilia, but is not a substitute for having your items authenticated by a well respected professional autograph authentication company. Reputable authentication companies include JSA, PSA, Panini Authentic, Upper Deck Authentic, Tristar and Mounted Memories to name a few. Click on any of the images below to view full size photos. A horizontal line on a 30-35 degree angle midway through the vertical line of the letter "T" connects with the easily legible letter "M"
Tracy Mcgrady Signed Autographed Orlando Magic Jersey! PSA!